Six men and two women have been arrested after a man was stabbed to death in Somerset. Armed police were called to Merlin Drive, Wells, on Saturday afternoon, following reports of a disturbance. 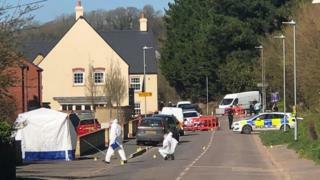 Two men were found on nearby Wookey Hole Road with knife wounds and one - a man in his 30s - died at the scene, Avon and Somerset Police said. The other is in hospital with non life-threatening injuries. The eight people arrested remain in custody. A post-mortem examination will take place later and the victim's next-of-kin have been told. "We're carrying out a full investigation into what is clearly a very tragic incident," Det Insp Alistair Hammett said.